Tea, wonderful tea. As you know I always enjoy a great tea party! But tea is not for parties only, in fact tea is part of my everyday routine. A cup of tea and an afternoon snack is how I rejuvenate after a full day teaching. 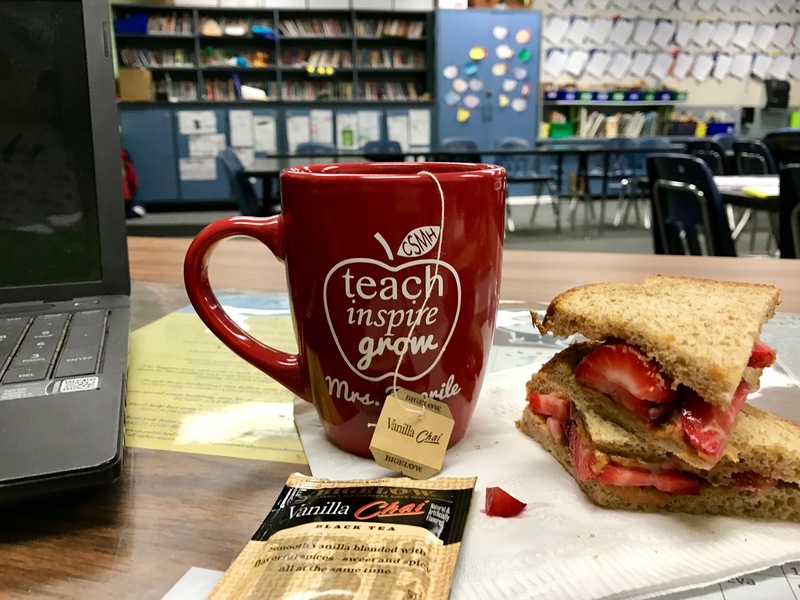 Once the students walk out the door, I fix myself a cup of tea and enjoy it with a light snack sitting at my classroom desk. I turn on some music, and then I am ready to grade papers before I pack up and head home to make dinner for my family. My tea routine really helps me transition from teacher to mom. It allows me a moment of quiet and peace – helping me create a moment of beauty and relaxation sitting right at my desk in my classroom. I Tea Proudly everyday with one of my favorite Bigelow teas. Honestly, afternoons are tough for me. After teaching the 72 students that rotate through my classroom each day, followed by manning carpool for 30 minutes, I am simply wiped. But my work day is not nearly over. 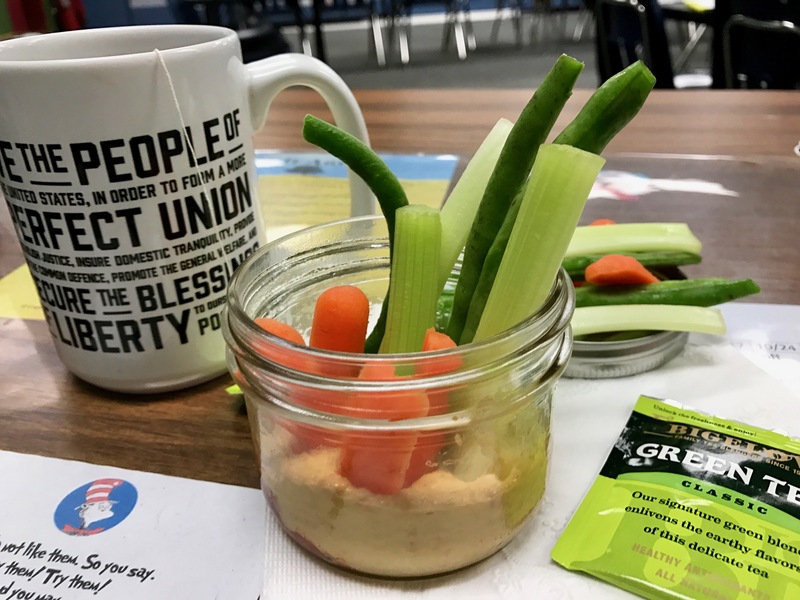 What helps me recharge and transition is to simply take the time to make a cup of tea and enjoy it along with a healthy protein filled snack. The combination of the two is my secret weapon for getting through the rest of the day. 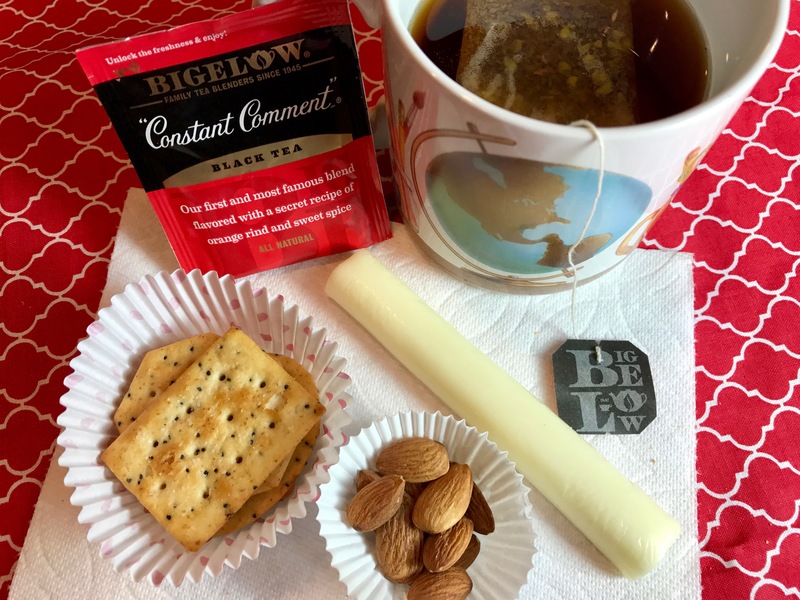 January is Hot Tea Month so I thought this is the perfect time to share with you my favorite Bigelow Teas and the afternoon snacks I enjoy alongside my steaming mug. 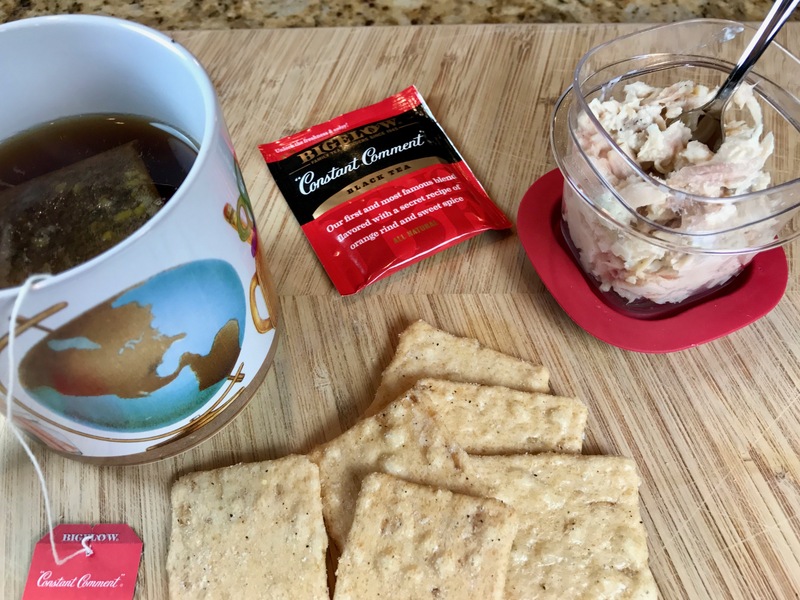 My teas snack are healthy, protein enriched, and portable – perfect to pack in the morning and enjoy in the afternoon. 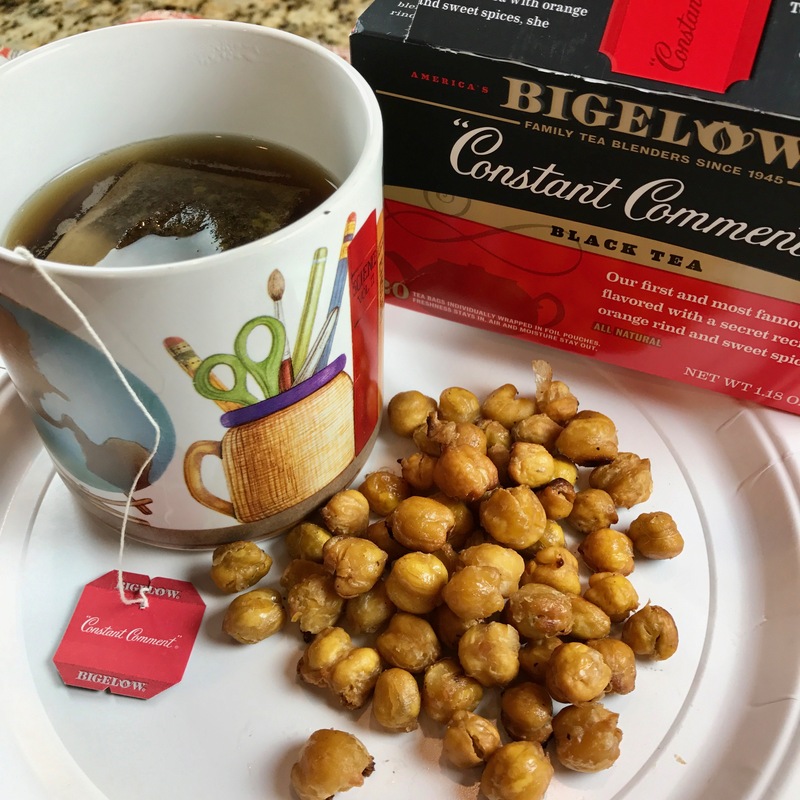 If you love Bigelow tea as much as I do, be sure to enter the sweepstakes at the end of this blog post! 2) 1/2 Nut Butter and Fruit Sandwich pairs perfectly with Bigelow Vanilla Chai – soooo yummy! 3) Roasted Chickpeas have a nice crunch that I enjoy with Bigelow Constant Comment. As you can tell Constant Comment, Green Tea, and Vanilla Chai are my Bigelow favorites. I keep the foil packages of these three teas in the bottom drawer of my desk. 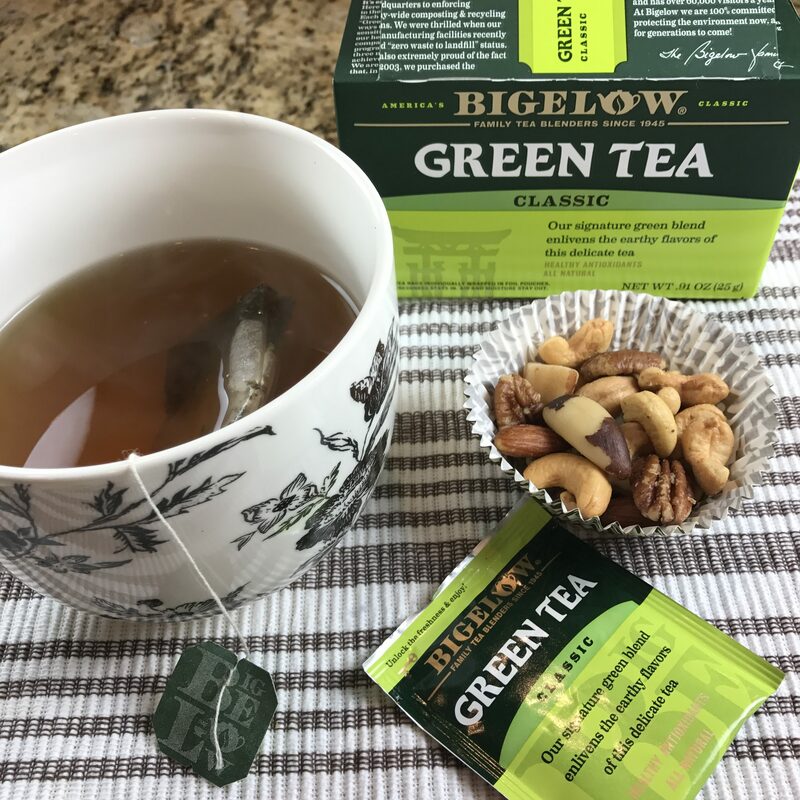 You just never know when you might benefit from the warm and cozy, soul-soothing experience that a mug of Bigelow tea can bring. 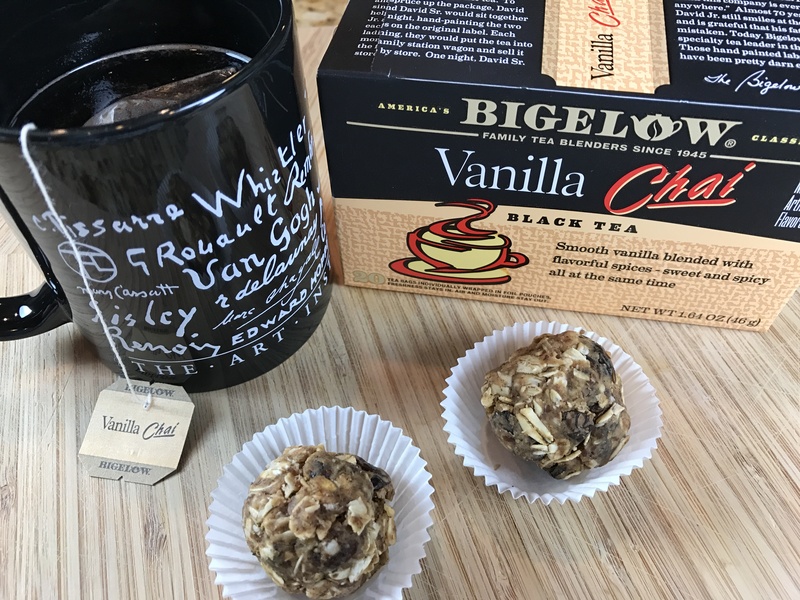 I can count on freshness and quality ingredients in every mug when it is Bigelow. Fun Fact: Tea is second only to water as the most widely consumed beverage in the world and 82% of Americans drink tea—that’s more than 158 million people who count tea as a top beverage choice. I am not alone in my love of tea. So while I am a coffee drinker in the morning, it is tea that is my afternoon go-to. Bigelow is building a Tea Proudly community bringing us tea drinkers together. 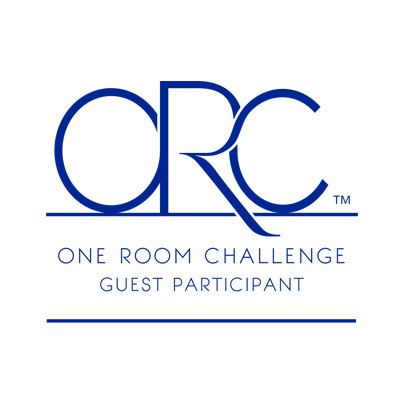 This is a place for tea drinkers from around the world to join together to learn what’s brewing with tea and to share your favorite tea moments. Like I said earlier, January in National Hot Tea Month, but if you are like me – you enjoy tea year-round. As promised here is the quick and easy recipe for the Almond Butter, Oatmeal, and Raisin Bites. Mix together well – you are going to need to use your hands to knead it all together! If it is a bit too dry add a little more almond butter, if it is too moist add a little more oatmeal. Once you get the right consistency, Roll the mixture into balls. I roll and squish it together, making a small dense bite-sized ball. 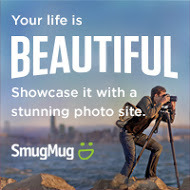 Don”t forget to enter the sweepstakes! I know that I can always find all of my favorite Bigelow teas at my local Walmart. 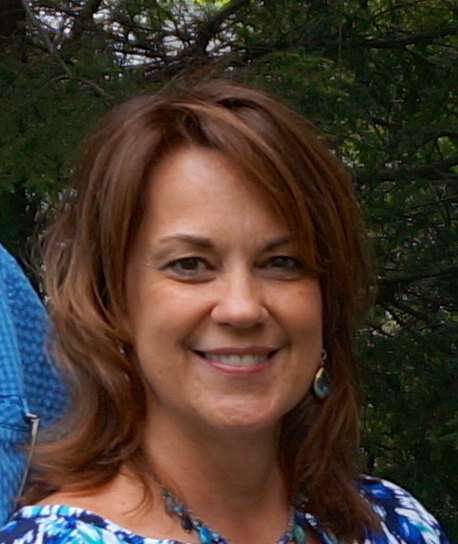 You can learn more at Bigelow’s following pages: Facebook, Twitter, and Instagram. I would love to know how you Tea Proudly. What is your favorite tea? Do you have any tea traditions? I love a hot cup of tea on a cold afternoon! I’m going to make the oatmeal bites today. I can’t wait to try them! I’m like you! I love my coffee in the morning but after that it’s tea. 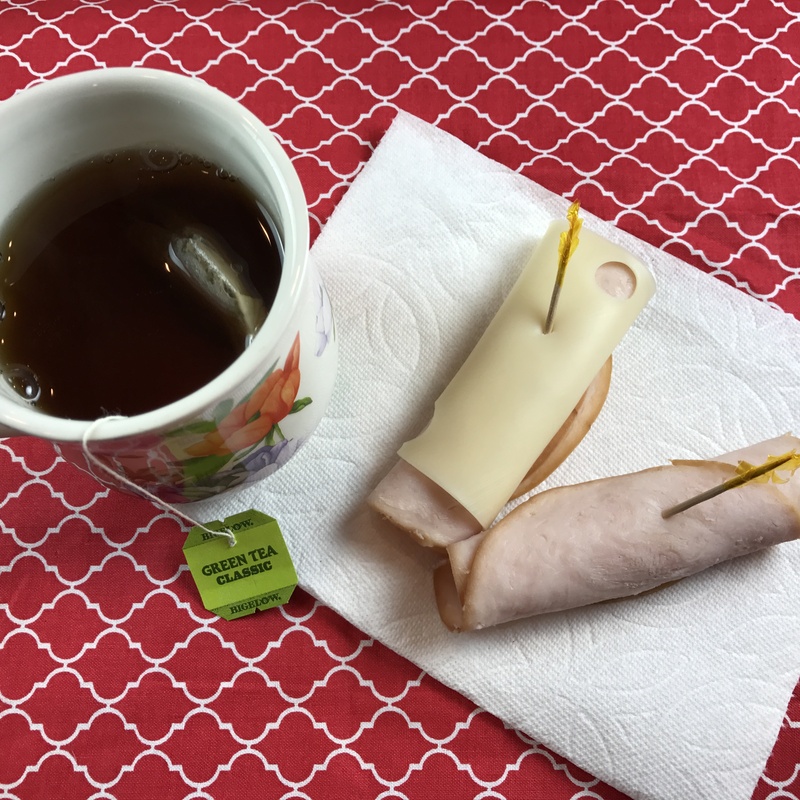 I’m a big Green Tea fan and there is nothing like a lovely snack and a cup of tea to recharge in the afternoon. The only thing that makes it better is someone to share it with!